The first of its kind green energy initiative in the Port of PE has proven successful. This pilot project has opened the door for larger projects in future, which is in line with the technological advancement of the Transnet Strategy 4.0 and the Smart People’s Port concept. “This sustainable and environmentally friendly project will also save cost significantly. The return on investment is an absolute bonus,” said Rajesh Dana, Port Manager. “It is introducing sustainable means of operations into the folds of the port. Capable of generating 1 800 kWh per month, it is the equivalent of energy consumed by six small households. 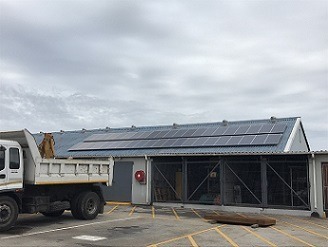 Based at the Civil Engineering Depot and connected to its distribution board, it is supplying the depot with energy primarily consumed by light equipment, appliances and lighting,” said Dana. There will be definite financial returns. Although the energy generated is consumed internally, it will reduce our external electricity cost to the municipality. The return on investment period is about seven years – it will thus take seven years for the savings to cover the initial infrastructure investment of R240 000. After this, we will generate pure savings. The project entailed the installation of a 13.5 kWp grid tied static solar photovoltaic system. It comprises of 42, 280W PV panels and a 20 kWp 3-phase inverter. The project was completed within four months at the end of last year. After three months of operation the installation has exceeded the benchmarks set and paved the way for larger installations. “We’ll soon be going out to market for a much larger installation, exceeding 500 kWp of renewable energy generation,” Dana concluded. The Port Engineers department and renewable energy service provider, Out the Green Box, were responsible for the implementation.